Diamonds are valuable gems, and many people like to adorn themselves with diamond earrings, necklaces and rings. Couples looking to get engaged often try to find the best diamond they can afford, and rich people buy expensive diamonds and keep them as part of their investment portfolio. There are many factors that contribute to the value of a diamond, including carat, quality, cut and color. 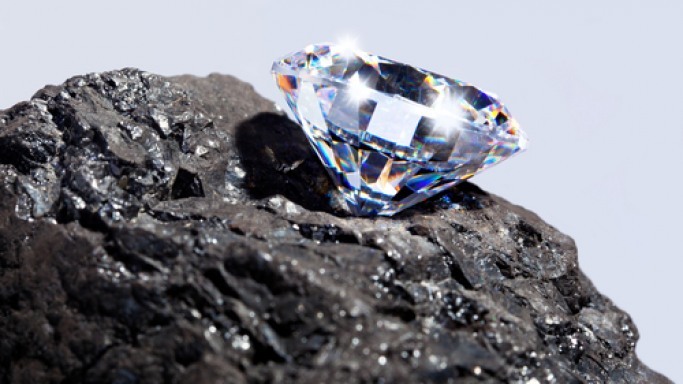 The following are the 11 most expensive diamonds in the world, the majority of the diamonds are either owned by private collectors or exhibited at the museum. The Koh-I-Noor diamond, is one of the largest diamonds in the world. This particular stone was discovered at the Kollur Mine in Andhra Pradesh, India. The gem was originally owned by the Kakatiya Dynasty. The East India Company seized it during a war and bestowed it as a gift to Queen Victoria in 1850. Its original weight is 186 carats. After it was recut into a brilliant oval, it still weighed 109 carats. 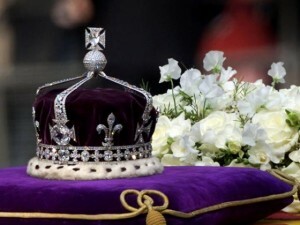 The diamond is set in the crown of the late Queen Elizabeth, which is exhibited at the Tower of London. The Koh-I-Noor diamond is the third largest diamond in the Crown collection. The Cullinan diamond is the largest rough gem-quality diamond in the world. The raw diamond weighs about 3106.75 carats and measures about 10.5 cm in length. It was originally discovered in a mine nearby to Pretoria in South Africa. The Cullinan diamond was later cut into 9 diamonds. The largest diamond of the collection is Cullinan I. Cullinan I, also known as the Great Star of Africa, is a pear shaped diamond that features 76 facets and weighs about 530.20 carats. 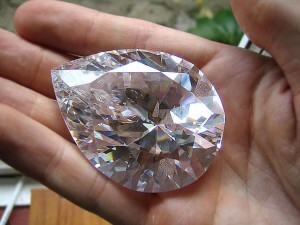 The second largest diamond of the collection is Cullinan II. Cullinan II, also known as Second Star of Africa weighs about 317.4 carats. Both Cullinan I and Cullinan II are on display at the Crown Jewels in the Tower of London. The Cullinan Diamond is estimated to worth $400 million. 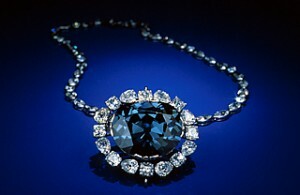 The Hope Diamond is the largest deep blue diamond in the world. It is believed that the diamond used to belonged to King Louis XIV of France. The diamond came into the possession of the French government in 1791. In the following year, the diamond was stolen and did not appear again until 1812. An American heiress called, Mrs. Evalyn Wash McLean, brought the stone to America. She set the diamond with the current setting, which features 16 white diamonds surrounding the Hope Diamond which is set in a pendant on a necklace chain made of 45 diamonds. The Hope Diamond weighs about 45.52 carats. It features an antique cushion brilliant cut. The gem has a faceted girdle as well as extra facets on the pavilion. The Gemological Institute of America rated it as a fancy dark grayish blue. The Hope Diamond has an estimated value in between $200 – $250 million. The De Beers Centenary Diamond, also known as The Centenary Diamond, is the third largest diamond produced from the Premier Mine. An X ray imaging system was used to find the diamond at the Premier Mine. The Gemological Institute of America rated the color as grade D colorless and features a modified heart shape cut. The diamond originally weighed about 599 carats. After being recut, the diamond weighed about 273.85 carats. The diamond has the highest number of facets, there are 247 facets on the final cut diamond. The pavilion and crown features 164 facets while the girdle features 83 facets. The De Beers Centenary Diamond has an estimated value of $100 million. Steinmetz Pink, also known as the Pink Star, is a flawless pink diamond discovered at De Beers mine in South Africa in 1999. The oval mixed cut gem features a step cut crown and a brilliant cut pavilion. The Gemological Institute of America rated the color of the diamond as Fancy Vivid Pink. The original weight of the diamond was 132.5 carats, but its weight was reduced to 59.60 carats after being recut. It was first worn by the supermodel Helena Christensen in Monaco in May 2003. Sotheby’s auctioned the Pink Star to a diamond cutter called Isaac Wolf. Since they couldn’t settle on the auction price, the diamond is now part of the inventory of Sotheby’s. 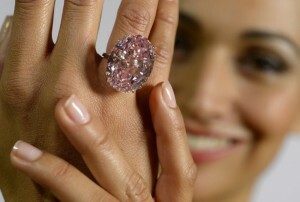 The Steinmetz Pink is estimated to worth $83.2 million. Wittelsbach Graff Diamond is a large deep blue diamond that weighs 31.06 carats. It was originally discovered in the mid 1600s in a mine at the Kollur Mine in the Guntur District, India. It features an antique oval stellar brilliant cut. It was purchased by Laurence Graff in 2008 for £16.4 million. Graff had the diamond recut to remove the flaws so that it became lighter by 4 carats. The original weight of the stone was 35.56 carats. The recut diamond was named the Wittelsbach Graff Diamond after the purchase. It has a diameter of 24.40 millimeters across, while the depth measurement is 8.29 millimeters. There are 82 facets in the diamond. The Wittelsbach Graff Diamond is estimated to be worth $80 million. The Graff Pink is a rare rectangular pink diamond that weighs 24.78 carats and features an emerald cut. The corners around the gem are rounded. It was originally owned by a jeweler named, Harry Winston. Winston sold the diamond at an auction in the 1950s. The diamond is set in a platinum ring with two unique shield cut side diamonds. The Gemological Institute of America rated the Graff Pink as Fancy Intense Pink and listed it in the Type IIa Diamond category. The Type Ila Diamond is the top 1-2% diamonds in terms of purity. It was auctioned to a British billionaire jeweler, Laurence Graff, in November 2010. The raw diamond had 25 natural flaws, but the jewel cutter was able to remove those flaws with less than 1 carat loss. The Graff Pink diamond is estimated to worth about $46 million. The Moussaieff Red Diamond is the largest fancy red diamond in the world. The gem features a trilliant cut. A Brazilian farmer discovered the stone at the Abaetezinho river in 1990. It’s most likely that the gem was formed by the alluvial deposits from the nearby mine. The rough stone weighs about 13.9 carats, but the weight was reduced to 5.11 carats after it was cut. The William Goldberg Diamond Corp. purchased the diamond and later sold it to an Israeli jeweler called Shlomo Moussaieff who was based in London in 2001. The Moussaieff Red Diamond was first on display to the public at the Splendor of Diamonds Exhibition in the Smithsonian Institution. 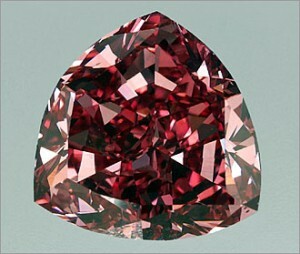 The Moussaieff Red Diamond is estimated to worth $20 million.